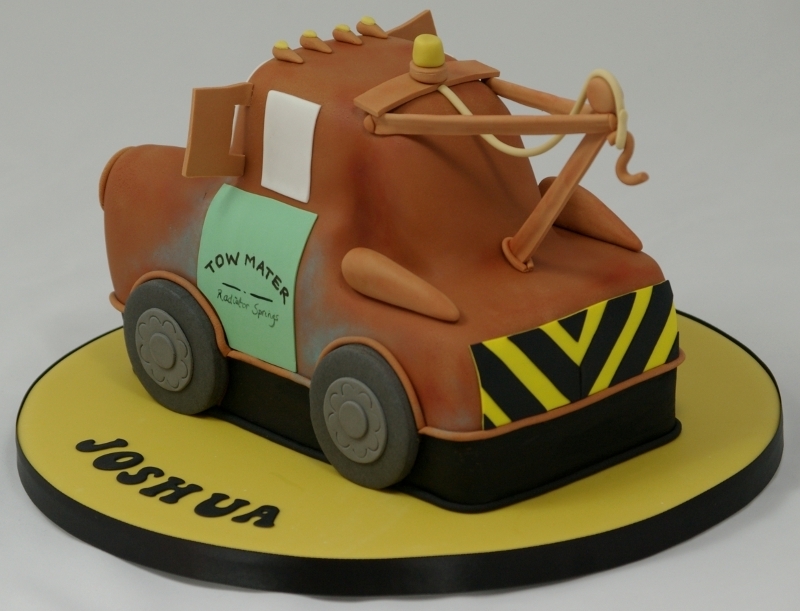 Meet Tow Mater – last weekend’s birthday cake and the one that I nearly threw through the window in its early stages! 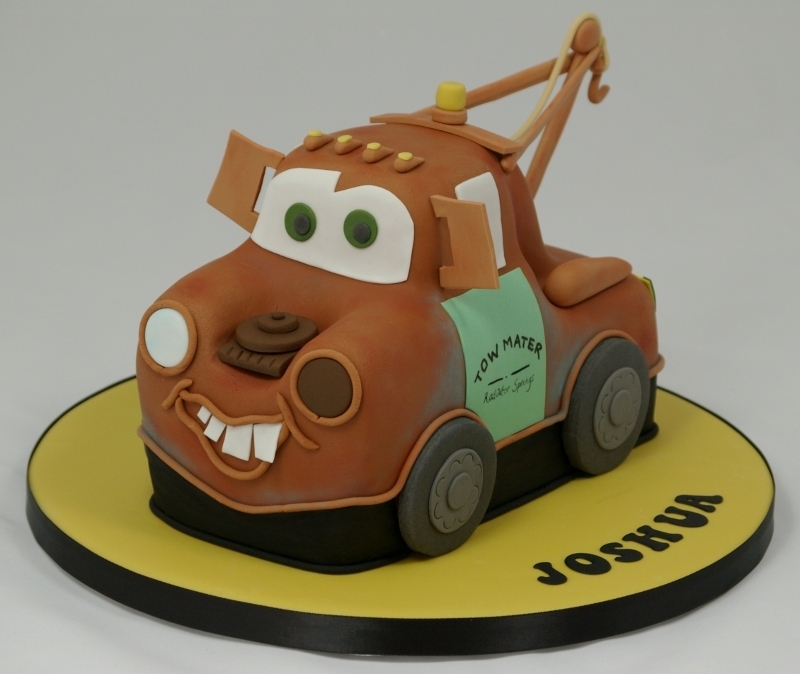 I often check out character cakes on line – I should have realised that Mater was going to be a challenge when I didn’t see as many amazing cakes as I would have expected. I fought a brave fight to get the brown icing on and I’m still not sure if in one go was the best way with the angles involved. Underneath the brown sugarpaste is a vanilla madeira cut and shaped from an 8″ square cake with the usual raspberry jam and vanilla buttercream. 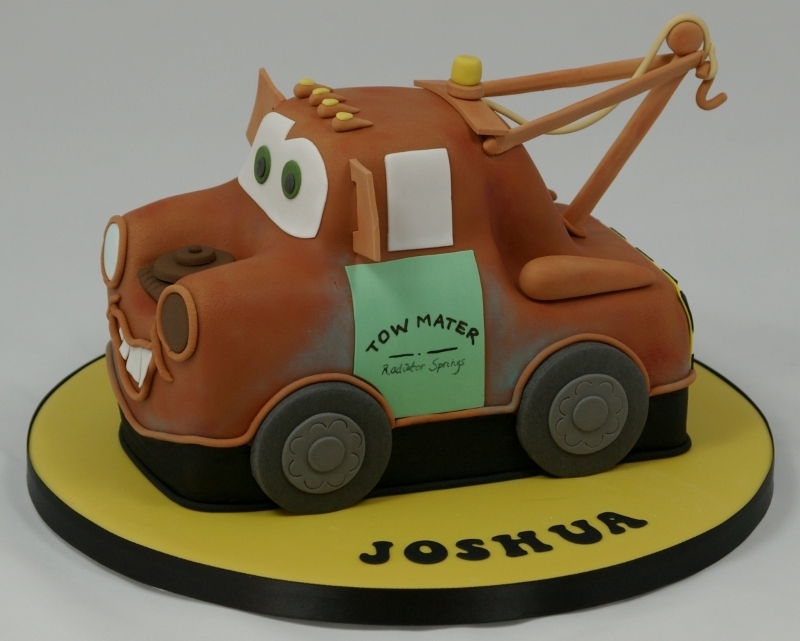 Mater’s hoist is strengthened with spaghetti (raw, for anyone wondering) but the rope is just icing which was carefully extruded (love that word!) through the craft gun. Finally, the cake was brushed with rust and blue dust colour. Despite the initial frustration I really loved the cake by the time it was finished – it had a little personality of its own. As seems usual now, I am a little behind on uploading my piccies, so here are two cakes that I did in the last couple of weeks, each featuring a model on top. 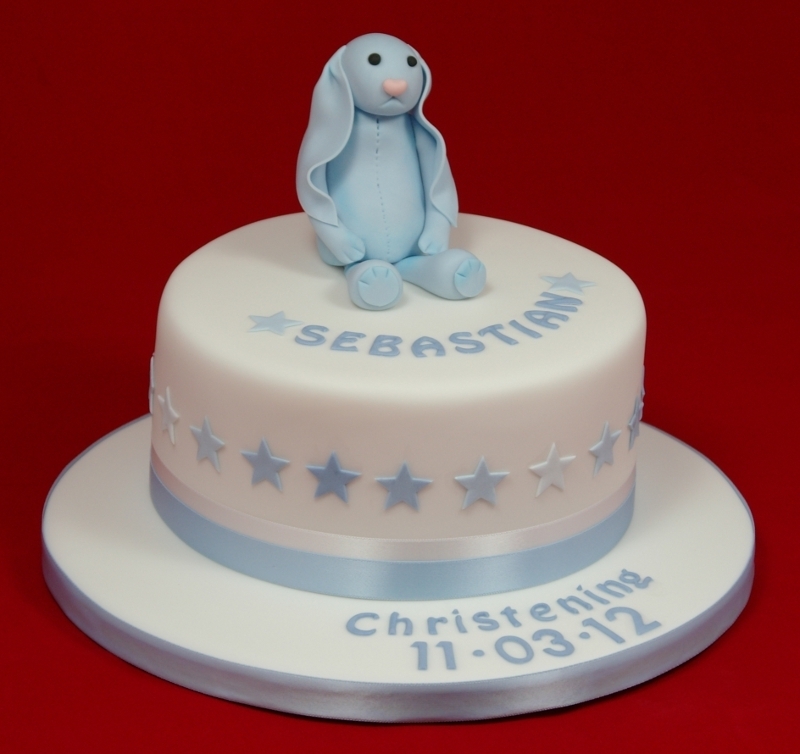 The Christening Cake features my interpretation of Bashful Bunny which was inspired by the baby’s favourite rattle. A preferred toy is a great starting point for a Christening cake or first birthday as it makes the cake very personal to the baby. Any photographs also act as a reminder of such a special time. To give an idea of scale, the cake is a 7″ vanilla madeira. I really like the clean design of the stars around the sides of the cake in graduating shades of blue. The second cake was a family birthday cake (hence I cut corners by using an un-iced economic board to sit the cake on – not my usual practice I hasten to add!) 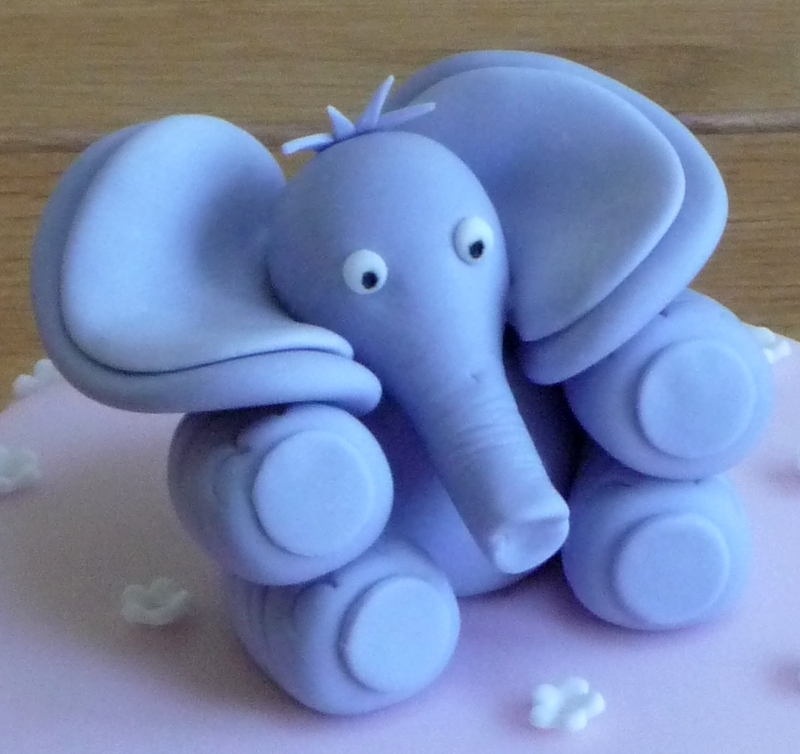 for an elephant lover (is there anyone who doesn’t love elephants?). This is slightly smaller at 6″. I love the white blossom cascading up the sides of the cake on the pale dusky pink background – simple but effective. 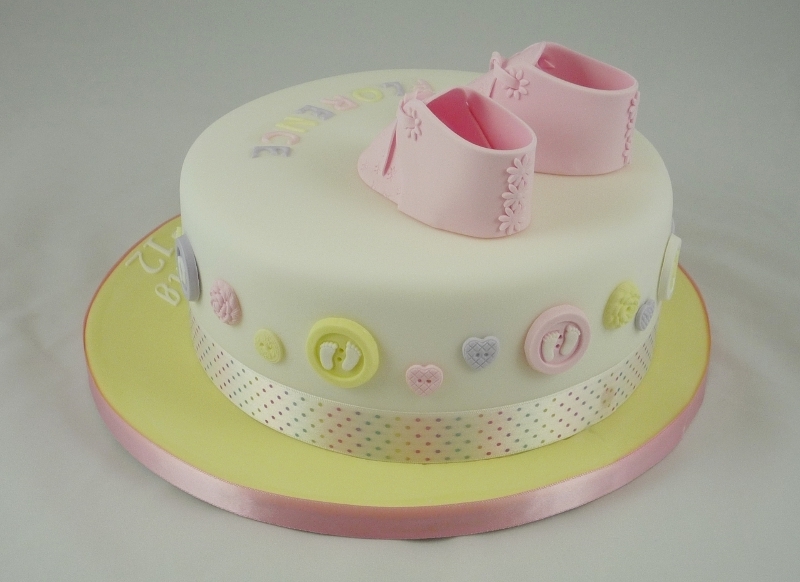 Although this cake was used for a birthday, it would also make a wonderful basis for another Christening Cake and could be upscaled with the addition of a second tier. This post is dedicated to anyone who has been missing my kitchen table in the photos! This is one of the cakes that I made last week. 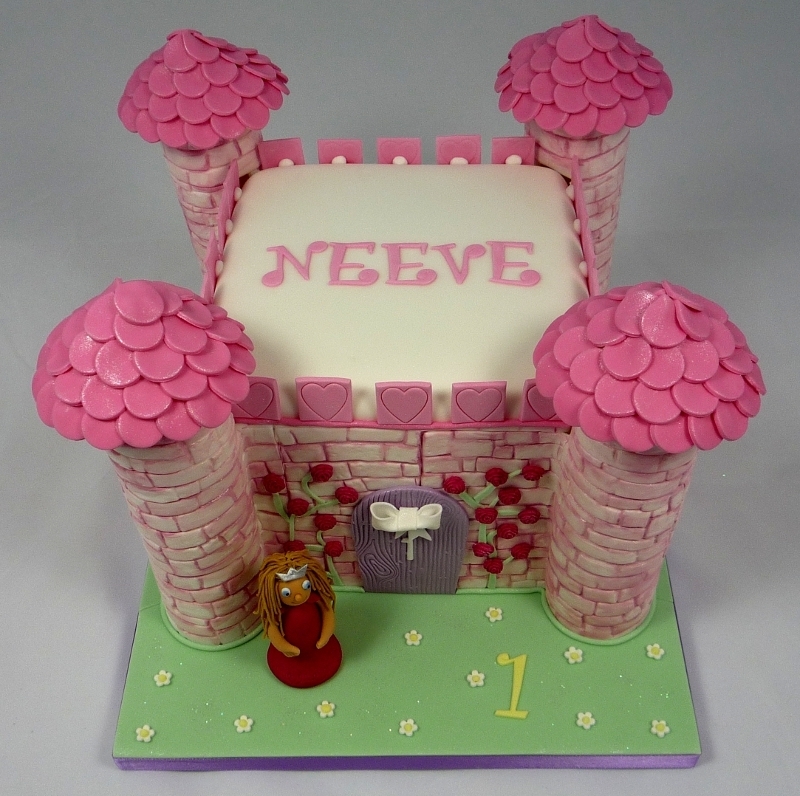 The brief was a pink and girlie princess castle birthday cake for Neeve who was turning one. 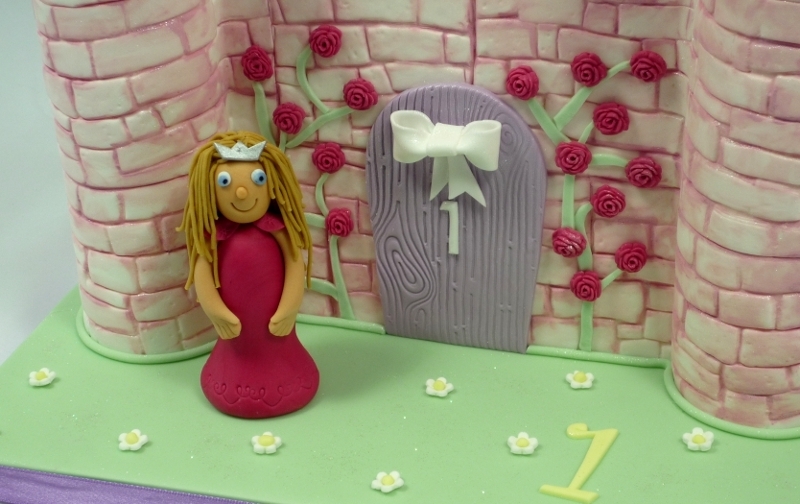 The cake is a square 7″ double height madeira cake. This was covered in white icing and the stonework impressed sugarpaste on the sides was painted with food colour ‘paint’ to add detail. The turrets are made from pastillage tubes which were attached to the square cake and topped with sugarpaste tiles. The hollow tubes made an ideal home for the handful of surprise pink Smarties I popped inside each of them! The sides of the cake (unseen) had heart shaped windows. 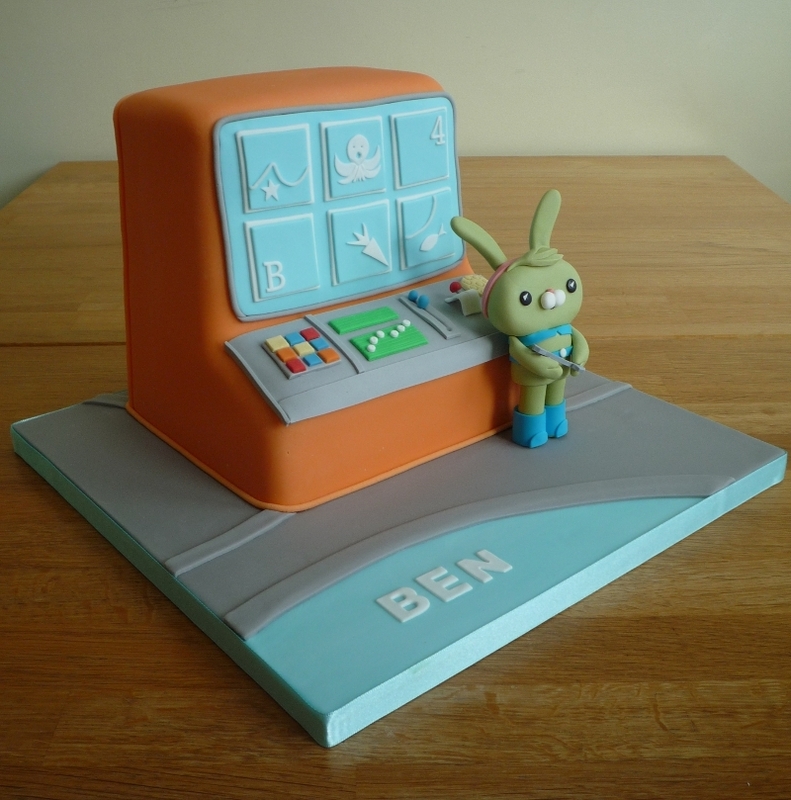 I was asked to make a birthday cake for a little boy whose favourite Octonaut is Tweak Bunny and this is the result! It is a vanilla madeira cake with the back of the cake a whopping three layers high. Tweak is the Octonauts’ engineer so I stood her in front of a control panel in the launch bay (I think that’s the right name!) holding a spanner and with a carrot on the screen behind her. The screens are also tailored to the birthday boy with the use of a ‘B’ for his name and his age. Correct me if I’m wrong, but I think Octonauts might be my most popular theme for a birthday cake, as this is the third one I’ve done now. It is a fantastic programme with an educational element and a great female role model in Tweak. Many happy returns to Ben. This is the cake that I made for a dear friend, for her 40th birthday the weekend before last. It is entirely edible (apart from the cake board and ribbon!). 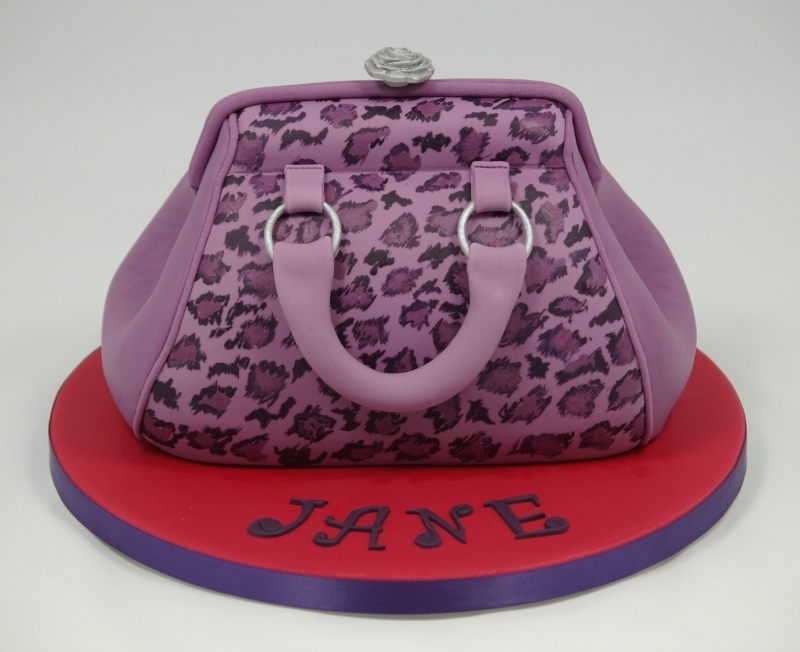 I was inspired by the handbag cake project in Lindy Smith’s Contemporary Cake Decorating Bible. Those that know this book, will know that I took my own direction with the surface design (and the exact shape too, if I’m honest! ), but the starting point was definitely Lindy Smith’s. Thanks Lindy! The cake was carved using templates and then sugarpasted, panel by panel. I haven’t iced a cake this way before and it was definitely the tricky bit, and slightly wasteful as the offcuts were tainted by crumb and buttercream so could not be re-used. I persevered though and you could see it come together when the beading went on and covered the joins. 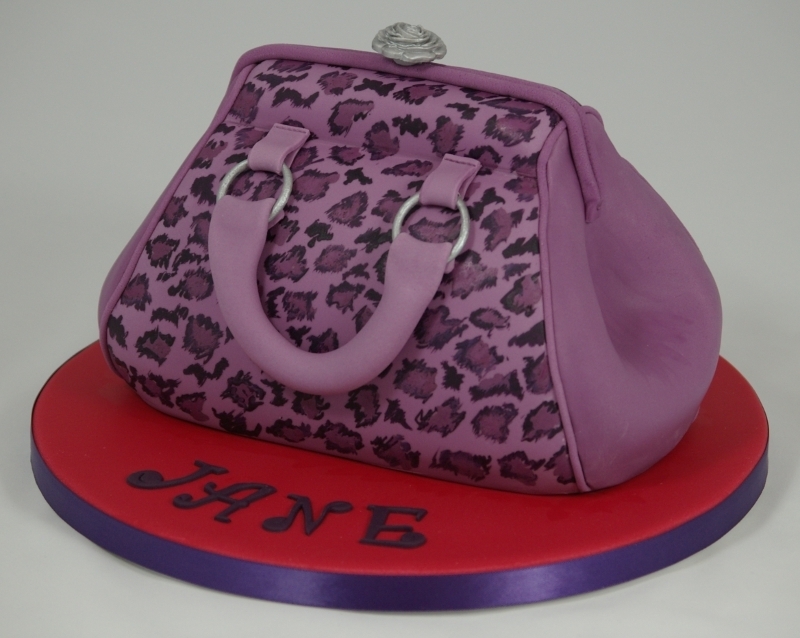 The leopard print effect was painted on with food colour. I really like the clasp and the hoops, which were another tricky bit actually now I come to think of it! I was extremely pleased overall with the end result. It was strangely satisfying when a mutual friend of the birthday girl couldn’t see the cake across the venue because she assumed it was a bag (ok, so it was dark but even so!). 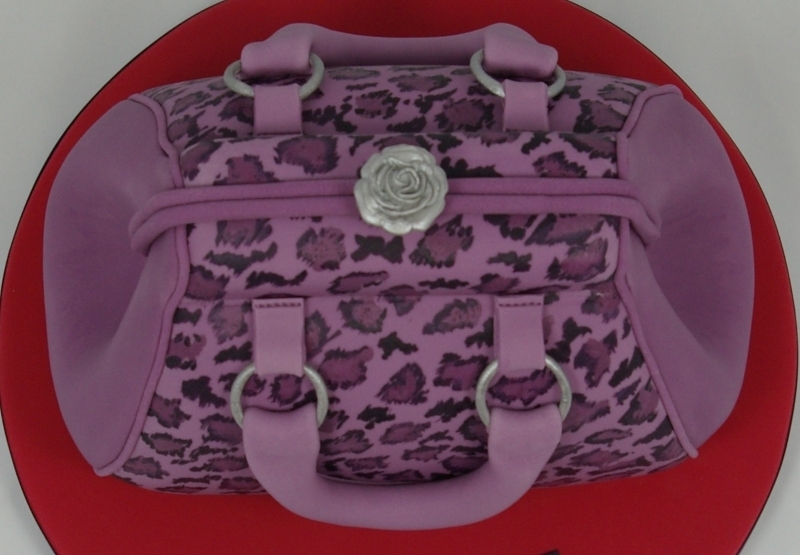 Well it’s been a busy old couple of weeks and I am behind on posting up pictures of my latest cakes! We are also trying to improve the standard of the pictures by using a light tent (when possible) and I am formatting them on the ‘puter too, to make them quicker to upload for you. So…this is taking a little longer whilst I get used to it. Anyhoo, this is a Christening cake I did for a christening a fortnight ago. 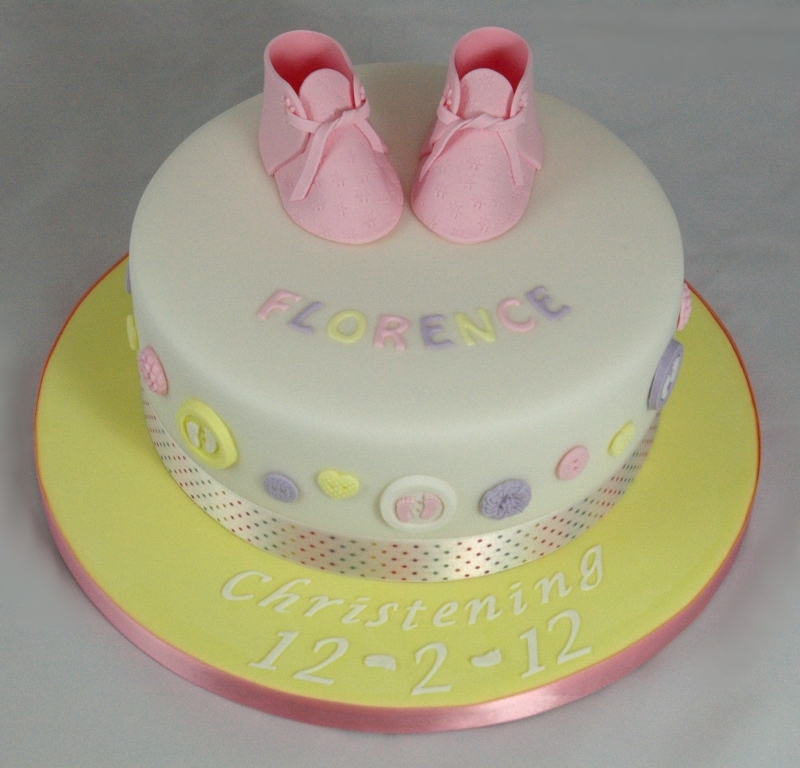 The brief was ‘pink and girly’ but I incorporated some lemon and lilac as well, so there is perhaps a little more colour than a traditional/typical Christening cake. That said, I loved creating the baby booties (made using a Jem cutter) and I do think that they instantly signify baby and ‘Christening’. 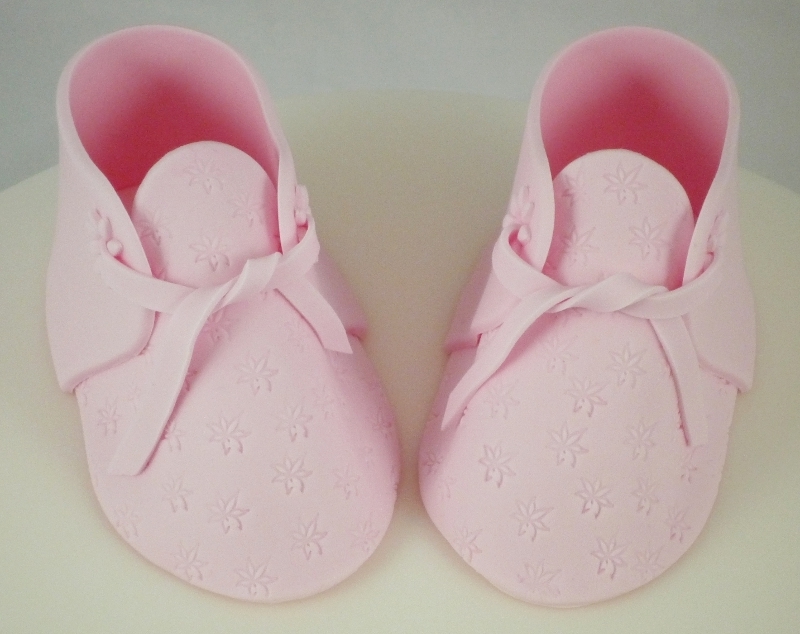 The feet theme is carried through on the button moulds used around the sides of the cake and the dashes to mark out the date are also little baby feet. I am quite taken with the spotty ribbon around the cake which brings together the colour scheme. Back to the gorgeous booties…I used an embosser to give more texture and interest to the front of the bootie and there are little blossoms around the eyelets and up the back of the bootie. 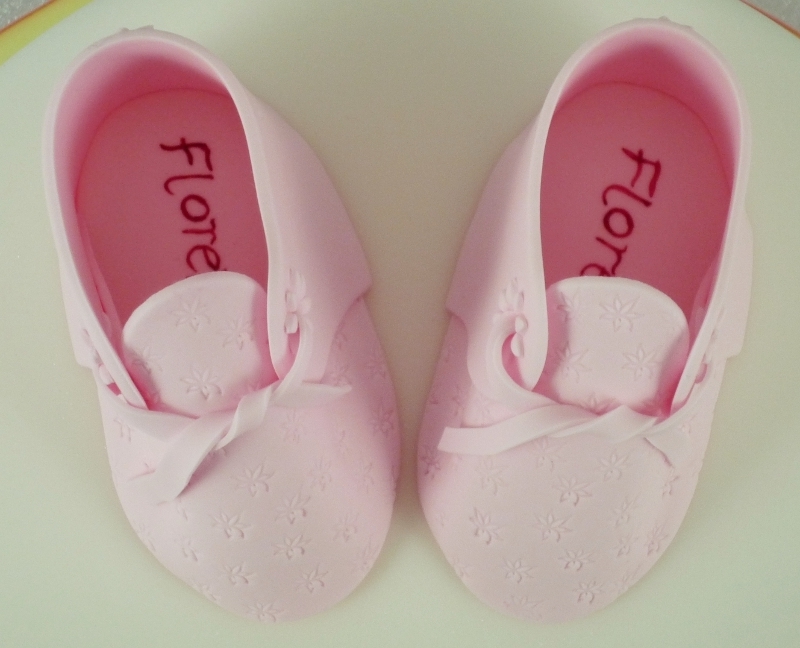 I put Florence’s name inside the shoes to personalise them – all children need their names in their clothes, right? Where possible, I love my cakes to have a little hidden, extra detail that isn’t immediately obvious. I was very pleased with this cake as I was aiming for something more understated than I usually do (?). It is a very versatile design – it could be upscaled to a tiered cake and it could be made for a boy, perhaps with a blue, green and orange colour scheme and stars or spots instead of the blossom. This is a birthday cake that I made last week. 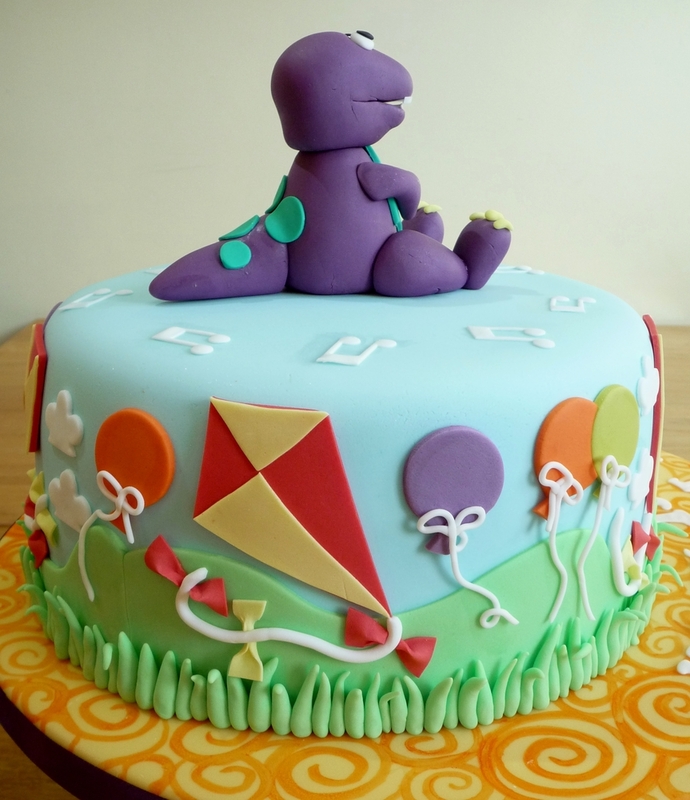 It is an 8″ chocolate fudge cake with a Barney the Dinosaur theme for Robert’s first birthday. The sides of the cake are brightly decorated with kites, clouds, balloons and a rainbow (which I love!). The ‘cake drum’ was covered with yellow sugarpaste and painted in a cheerful, swirly pattern. I was aiming to create something visually stimulating for a one year old. The cake is off-centre on the drum to allow for the birthday greeting – a larger drum is an easy way to create a bigger impact without having to increase the size of the cake.